Enjoy and exciting with Elephant Trekking in the abundant forest and small canal. Enjoy and relax in your own natural “hot-tub jacuzzi” filled with running spring mineral hot water at a pleasant 35 ํ-40 ํ at hot spring waterfall, known as it’s good for your health. 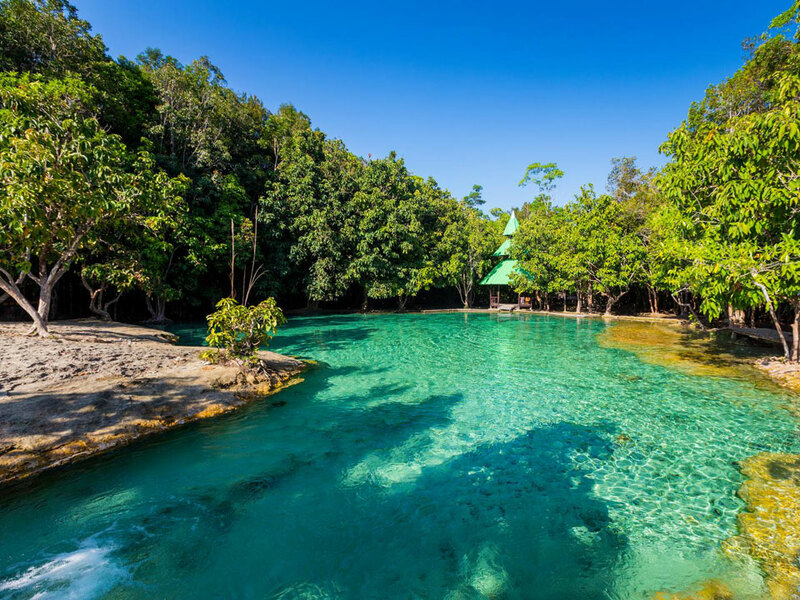 Visit the Emerald pool, a stunning eco-tourist spot with visually beautiful aquamarine colour surrounded by tropical rainforest and enjoy swimming at the natural pool. 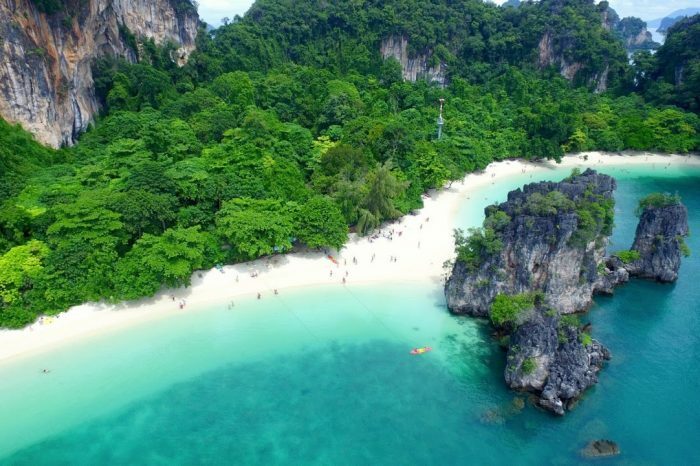 Delve into Krabi’s jungle on a one day tour to discover unique hidden sights like the Tiger Cave Temple , the Emerald Pool and Hot Spring Waterfall. 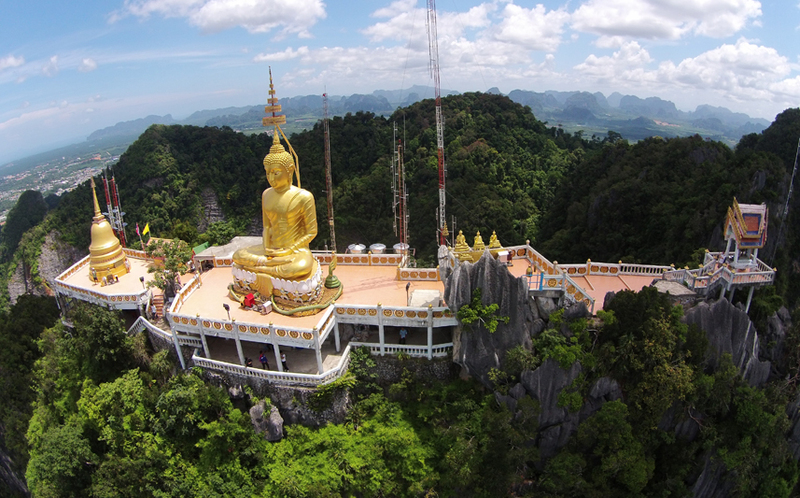 Visit Tiger Cave Temple , Krabi best loved forest temple , fantastic cave and 1237 stairs to the viewpoint at the top of mountain. Enjoy walking in the jungle among the fantastic old trees and abundant rainforest. Enjoy a various set lunch at a local restaurant. Price : Adult = 700 Baht; Child = 550 Baht. Price : Adult = 800 Baht; Child = 650 Baht. Price : Adult = 1,100 Baht; Child = 900 Baht. Takes the tourists to visit beautiful and abundant forest of Krabi Province such as Tam Suea Temple (Tiger Cave Temple), Morakot Pond (The Emerald Pool) and Hot Spring Waterfall which are located in extensive rainforest with varieties of plants and wild animals, Tam Suea Temple (Tiger Cave Temple) has been situated in the forest plantation, plain area, valley, the cave cavity and cliff. 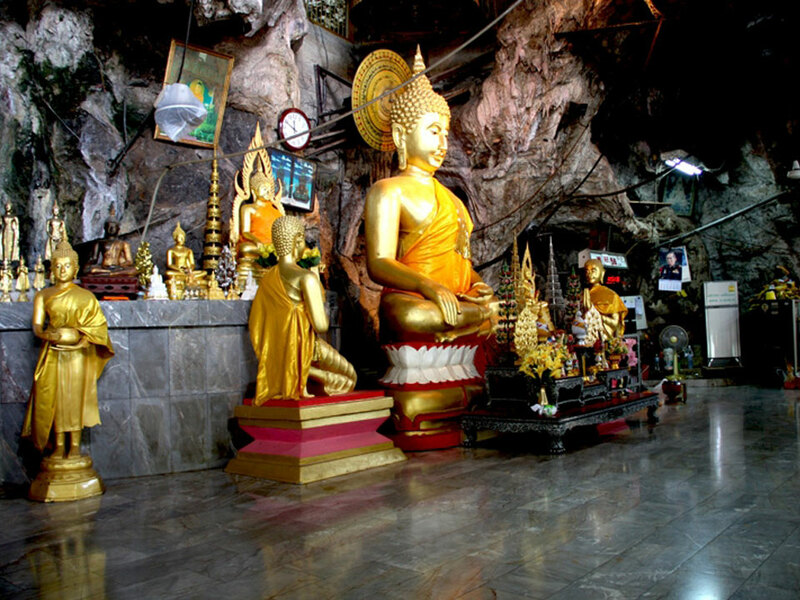 Regarding the name of the temple, it has been assumed that in the past, there were the tigers living and inside the cave appears natural stone with the feature of the tigers’ paws, some caves that have been situated in the area of the temple are used for the center of meditation of the monks, laymen and laywomen as well, the warm creek is an origin of “Morakot Pond (The Emerald Pool)” in the Southern lowland forest which is a hot spring with a temperature of 35-40 degrees Celsius, a beautiful clear pond in the middle of the forest and it has clear viridian green water that can change its color by the time, date and lighting conditions, around the Morakot Pond (The Emerald Pool) is a shady green forest area with the richness of the varieties of plants and the place to see scarce birds such as Gurney’s Pitta, Rufous-collared Kingfisher and Black hornbill. “Hot Spring Waterfall” is another one of unseen Thailand in Krabi Province near Morakot Pond (The Emerald Pool), it is a natural bathtub supporting the line of waterfall flowing down from the hill, the waterfall is hot water and consists of various minerals with a temperature of 35-40 degrees and helps relaxing the body. 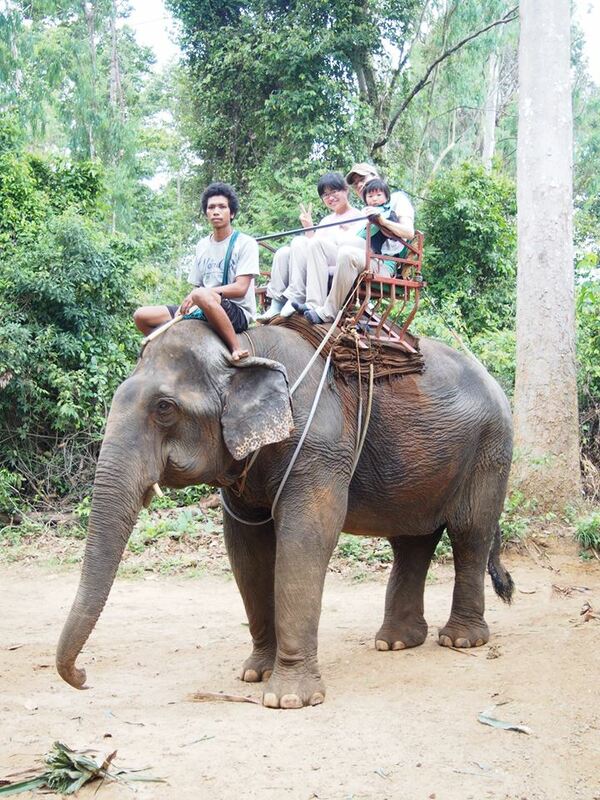 Elephant trekking ,this is a special experience for kids or adults. Riding through the jungle on the back of an elephant is not forgotten quickly. Along step 1237 stairs to Buddhist shrines on the top of mountain. We are ready to service you with cheerful elephants. 08:00am – 09:20am Pick you up from your hotel. 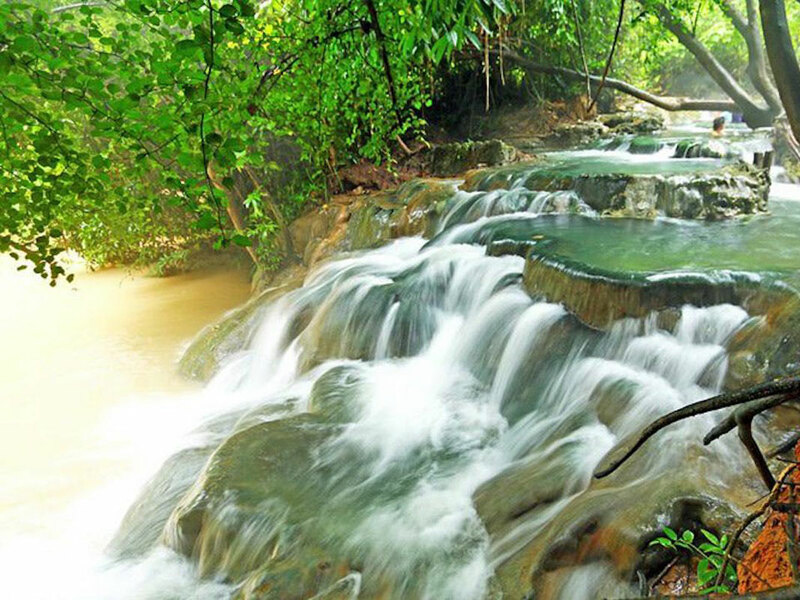 10:30am Arrive at the hot spring waterfall, relax in the natural bathtub with mineral hot water. 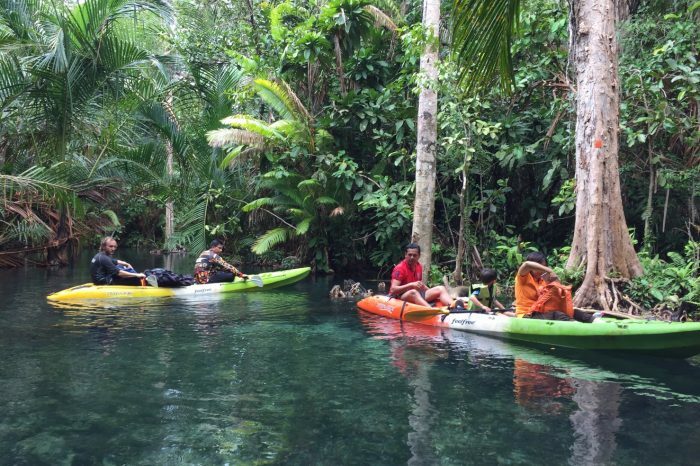 11:15 am Departure to the National Park, a half hour walk in the rainforest and visit the Emerald Pool , enjoy swimming in the natural pool with emerald clear water. 12:30pm Enjoy delicious lunch in the restaurant. 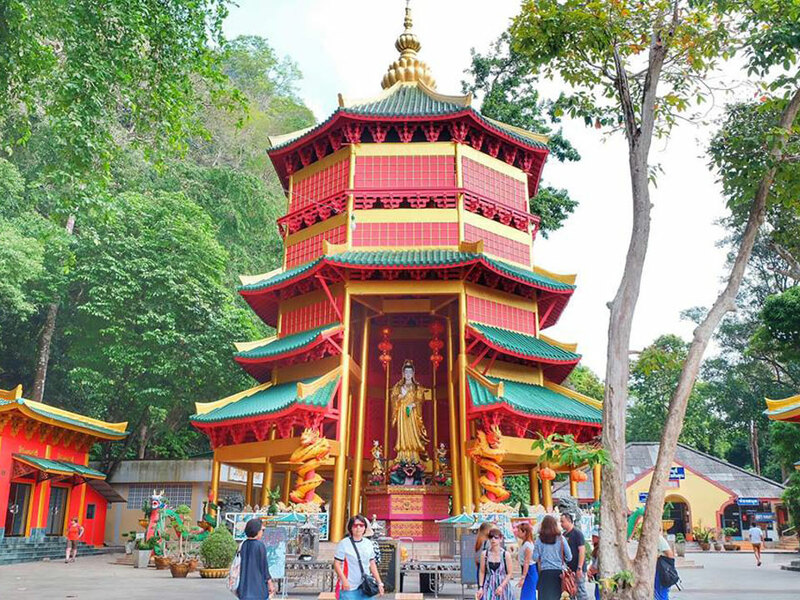 02:00pm Arrive Tiger Cave Temple , sightseeing and exploring. 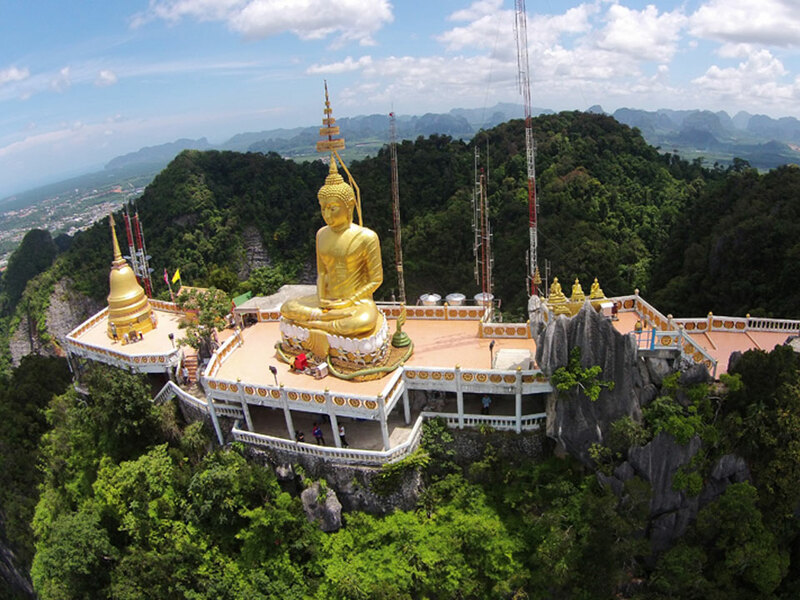 The Tiger Cave Temple is a Thai Buddhist meditation center and also has places of archaeological and historical significance. 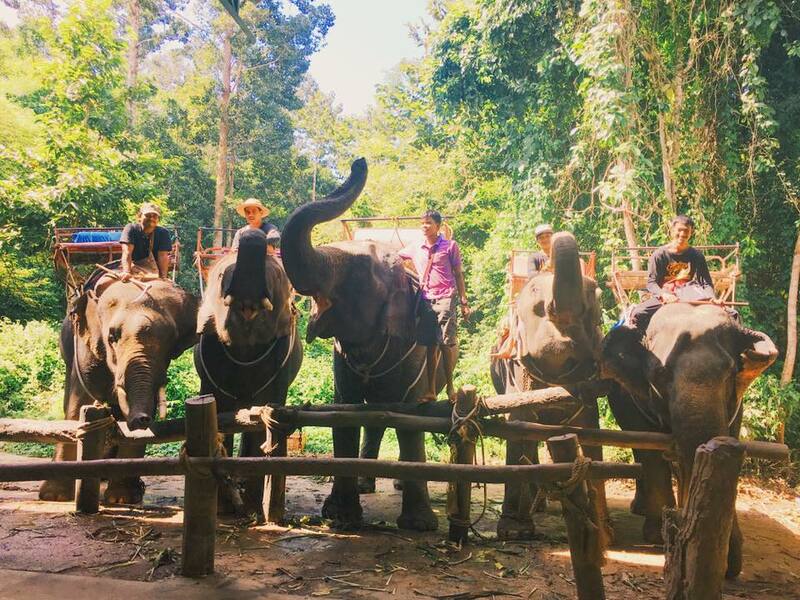 00 pm Enjoy and exciting with Elephant Trekking in the jungle and small canal. 05:00pm Transfer back to your hotel. Child ticket: Age between 3-11 years. 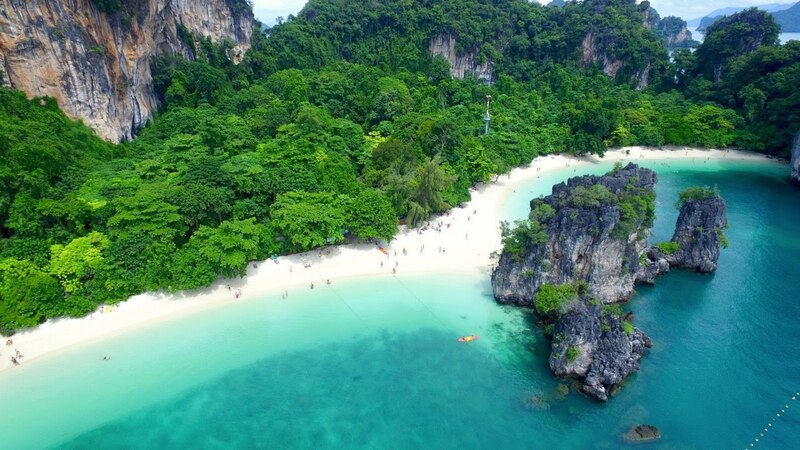 Free hotel pick up is available for Krabi town , Ao Nang and Klong Muang. 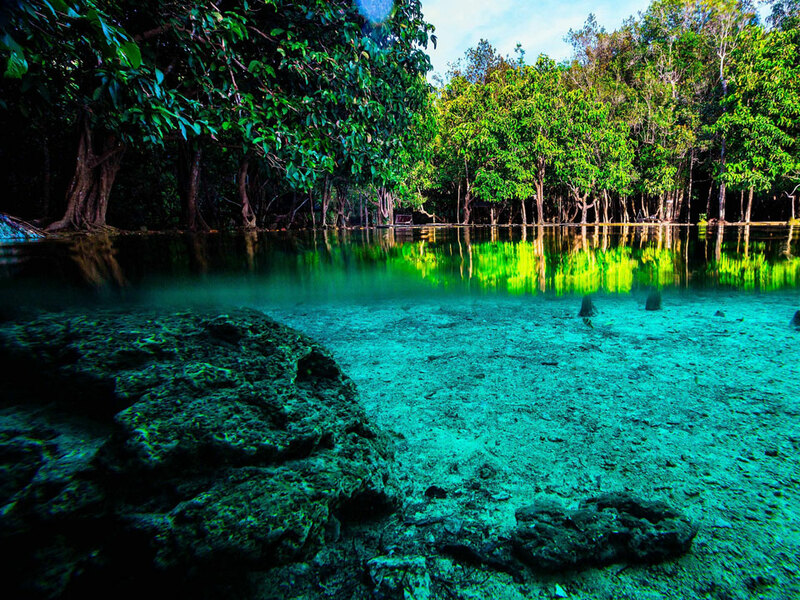 Remote areas including Tub Kaek require an additional charge of THB200 per person (payable directly to the driver). There is a minimum of 10 people required to run this tour! On the rare occasion that we should be required to cancel a tour, we will inform you in advance and offer a different tour date, an alternative tour or provide a full refund. You will receive a confirmation email and voucher instantly after booking completed. In the case that you do not receive an email from us, please check your Spam folder or notify us via email. You can present either a printing or a mobile voucher for this activity. Please arrive in the hotel lobby 15 minutes before the scheduled for departure. Scheduling can change due to weather conditions without prior notice. You will be notified in advance. You can cancel your booking 2 days prior to your scheduled date of departure and receive a refund for cost of the tour.